Elated by what’s been considered a successfully run Under-17 Women’s World Cup, the head of the Costa Rican Football Federation (Fedefut) said next he wants to organize a lower-level men’s World Cup championship. Fedefut President Eduardo Li said he was thrilled with how Costa Rica completed one of the biggest projects the country had ever seen. At this point last year, FIFA had actually taken away the Under-17 Women’s World Cup from Costa Rica after the country had fallen significantly behind schedule. But high-ranking Costa Rican officials, including Costa Rica’s President Laura Chinchilla, asked FIFA for one more chance. The country received it, got reorganized and proved themselves worthy of hosting duties to FIFA directors. On Thursday, Li held a joint press conference with FIFA President Joseph Blatter, to mark the end of the Under-17 Women’s World Cup. The tournament’s final will be disputed between Spain and Japan at the National Stadium on Friday afternoon. 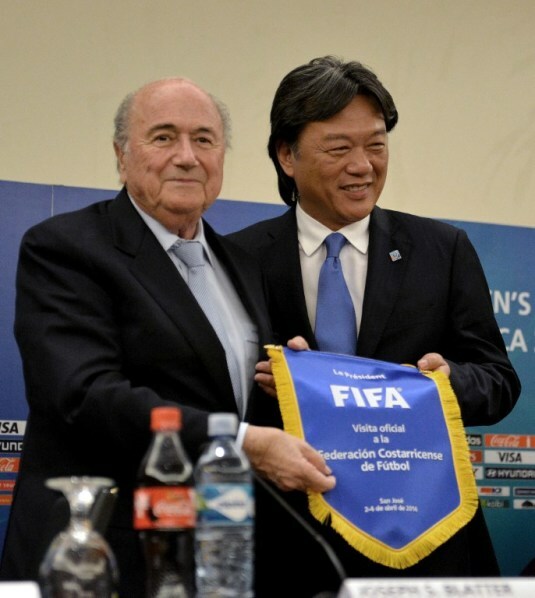 “Making official our desire to keep growing, I do not discard the possibility of seeking hosting duties for an Under-17 or Under-20 Men’s World Cup,” Li said. Blatter praised the organization of the first World Cup ever hosted in Central America. However, he warned that more infrastructure will be needed if Costa Rica wants to host a men’s tournament. “Right now the country has facilities to organize a competition with 16 teams, but to organize a competition with more teams will require more facilities for football,” Blatter said, referring to the fact that this women’s tournament has 16 teams while a junior-level men’s World Cup has 24 teams. He said that before considering the candidacy of Costa Rica for a men’s tournament, FIFA would have to analyze the results of the women’s tournament that is nearing completion, but he noted that the assessment would be positive. Li called on the public to fill the National Stadium for the final two games of the Women’s World Cup (Venezuela and Italy play for third place, prior to the championship) so that Costa Rica breaks the attendance record for Under-17 Women’s World Cup tournaments. “I invite the people of Costa Rica to break the record. The record was set in Azerbaijan with 257,000 fans (in 2012 ) and we current have 227,000. If 35,000 spectators (the National Stadium’s capacity) come to the games Friday, we break the record,” Li said. President Laura Chinchilla gave public employees a holiday starting at noon so they can go to to the final and third-place match.